Three police officers in Dallas were killed and seven others were wounded on Thursday night, Dallas Police Chief David Brown said in a statement. Brown said two snipers shot the 10 from elevated positions during a protest. Two officers are in surgery and three are in critical condition. No suspects were in custody. One Dallas Area Rapid Transit officer has been fatally shot during a protest over shootings by police of black men in Louisiana and Minnesota, the agency tweeted. Video showed numerous police officers crouching behind vehicles. Others approached a location holding protective shields. The shootings occurred as Americans across the nation vented their anger over the police killings of two black men in two days. They chanted outside the governor’s residence in St. Paul, Minnesota, miles from the spot where an officer killed Philando Castile in a car on Wednesday while a 4-year-old girl sat in the back seat. Crowds milled in the streets outside the convenience store in Baton Rouge, Louisiana, where Alton Sterling was fatally shot while police grappled with him in a parking lot Tuesday. Protesters briefly shut down the Dan Ryan Expressway in Chicago. In New York, 1,000 people marched down Fifth Avenue and a few scuffled with police officers. 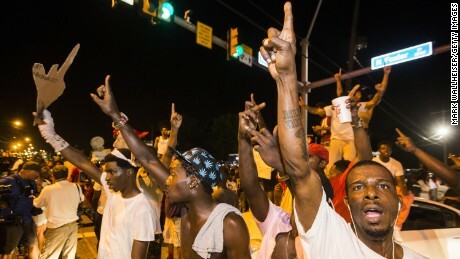 They all came out to vent their rage at yet more slayings of black men at the hands of police officers. The mighty also raised their voices. President Obama talked about the shootings, saying “This is not just a black issue.” Democrats came out as a group onto the steps of Congress to show their support for the victims. Beyoncé, one of the most famous American pop stars, posted a message on her website, saying “It is up to us to take a stand and demand that they ‘stop killing us. '” The singer provided a link for fans to contact their congressmen. Virtually every major city reported a gathering of some sort. Little violence was reported, but many tears were shed. She also urged an economic boycott to bring attention to the killings of black men. “The only thing they know is money,” she said. As has become the horrible norm, both killings were captured on video and posted online, helping the outrage spread across the country at lightning speed. The shooting of Castile was remarkable — and heartbreaking — because it was live-streamed by his fiancee, who calmly narrated the action and showed viewers the dying man groaning and bleeding in the front seat. Castile, a school food services worker, was shot in Falcon Heights, outside Minneapolis, when a police officer pulled him over because of a broken taillight, said his fiancee, Diamond Reynolds, who was in the car with Castile, along with her 4-year-old daughter. In interviews throughout the day, Reynolds complained that other officers responding to the scene were more concerned about the officer who fired the shots than Castile. A woman rings the doorbell at the gate of the governor’s mansion in St. Paul, Minnesota. As news of Castile’s killing spread, a crowd formed at Minnesota Gov. Mark Dayton’s residence and grew throughout the day. Many ethnic groups were represented, including Aztec dancers who said they wanted to show the diversity of the community. Among the protesters was Michael House, who said he grew up in the same neighborhood with Castile. “I’m here because my longtime friend got killed by a police officer and we need justice out here,” he said. A source close to the investigation told CNN that problems started when a homeless man approached Sterling on Tuesday and asked for money, becoming so persistent that Sterling showed him his gun, the source said. “I told you to leave me alone,” Sterling told the man, according to the source. The homeless man called 911 and police arrived at the store. Sterling was tackled and taken to the ground, the video shows, and during the scuffle he was shot several times by police. Protesters block traffic and dance on cars near the Triple S Food Mart in Baton Rouge. A law enforcement source with knowledge of the investigation told CNN that the officers pulled a gun from Sterling’s body at the scene. No further details were provided on the type of firearm. The convenience store quickly became the site of protests. Tokens, flowers and signs piled up in a makeshift memorial. Protesters chanted “Hands up, don’t shoot,” the line made famous in the Michael Brown shooting in Ferguson, Missouri, about two years ago. A prayer vigil was held at a church. A minister urged anybody who carried a weapon to take it out of the sanctuary and store it in their car. They didn’t have a permit, but police said they would allow the march to continue as long as it remained peaceful. Video later showed police scuffling with a few protesters but it wasn’t known if anybody was arrested.